Bring your family and friends to GEOF’s annual CSA Harvest Festival on SUNDAY, OCTOBER 18th from 11am to 3pm. Good food, cooking demos, kids’ activities, live music, walking tours and more! Come meet your farmers and see how and where your food is grown. + FREE for all current CSA members and their guests. + STROLLERS welcome & encouraged! + WEAR sturdy walking shoes for touring the farm. 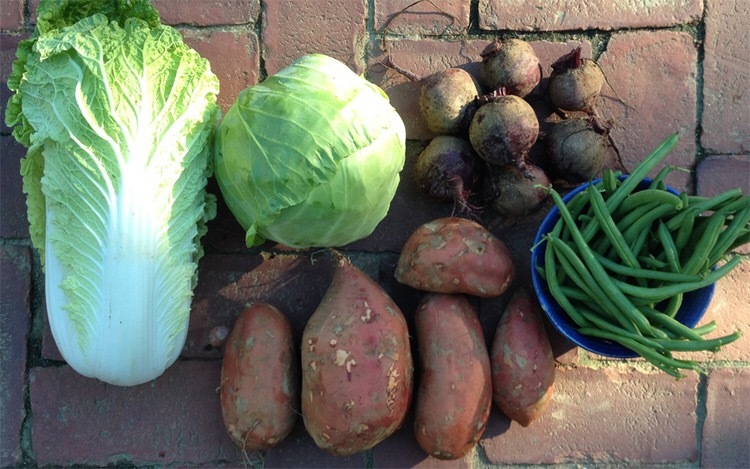 We’ve now opened up our registration for our Early Winter CSA Program! This program is separate from our 26-week Full Season CSA. It consists of 3 deliveries (spaced 2 or 3 weeks apart) starting in December. The winter share boxes consist of our own CERTIFIED ORGANIC root vegetables and storage crops like Potatoes, Sweet Potatoes, Watermelon Radish, Carrots, Beets, Rutabaga, Winter Squash, and possibly Broccoli, Kale and Cabbage. Exact contents may change. We also offer a Cider and Apple Share from Briermere Farms that is not organic. Green & Napa Cabbage – It’s a cabbage box this week! I happen to love cabbage and we eat it every which way – in soups, salads, roasted, shredded… The green cabbage is new to the box, but we had enough Napa cabbage for one more delivery, so we thought, why not? Is last week’s Napa cabbage still sitting in the back of your fridge? Have no fear…I’ve linked lots of cabbage recipes in our Recipe section below to help you make it through your box. Hey, you may just start loving it as much as we do! Green Beans – Farmer Matt wanted me to tell you that the beans are on the large size because we had to wait a few extra days to harvest them after the fields dried out from all that rain. Green beans with toasted almonds are such a treat alongside main dishes this time of year. Beets – Forget roasting if you don’t feel like turning on the oven. I boil these beets until tender in a pot of water on my stove. Throw them in with the skins on and boil for about 30 minutes. Just watch the water level as they can boil dry quickly. Once they’re cooked, you can slip off the skins easily. I’ve been serving them sliced with butter, salt & pepper and a drizzle of fresh squeeze orange juice and orange zest. So good! Sweet Potatoes – These will last a little while as long as they don’t get cold damage, so be sure you DO NOT STORE THEM IN THE FRIDGE! Keep them in a cool (but not cold) spot in your kitchen or pantry.